A circulating photo of a giant wolf allegedly killed in Sun Valley by the Idaho Department of Fish and Game is a hoax, say state officials. "That thing has gone viral!" said Todd Grimm, spokesman for Idaho Wildlife Services. Grimm said he first saw the photo in summer 2009, when it circulated and then faded before resurfacing last week. "I can tell you it's not in Idaho," he said. The photo shows a hunter, outfitted in camouflage hunting gear and leather gloves, holding what looks to be an enormous wolf in an upright position. The wolf, end to end, is slightly larger than the hunter. The alleged hoax was posted on a Caldwell woman's Facebook page on Oct. 26, listing the location as Sun Valley, Idaho. The photo has since been removed, and the woman could not be reached to determine how she came across the photo. However, Regan Berkley, a wildlife biologist with the Idaho Department of Fish and Game, said she's seen the photo attributed to a myriad of locations. "I'm almost certain it wasn't from the Sun Valley area," Berkley said in an email to a Jackson Hole Weekly reporter, adding that she's seen it listed as being killed in Idaho, Montana and various parts of Canada. Canada might be the best guess, according to wildlife officials. 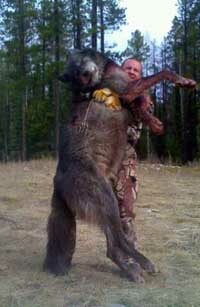 Grimm said the man in the photo is likely holding the wolf in Alberta or British Columbia. Randy Smith, big-game manager for the department's regional office in Jerome, said the first time he saw the photo, it was listed as having been taken in British Columbia. "The next time I saw it, it was marked Idaho," he said. Snopes.com, a site dedicated to studying and potentially debunking Internet myths, has set aside a comment thread for the photo. According to commenters, the wolf has been suspected as killed in Edson, Alberta, "just east" of Yellowstone Park, in Manitoba, and near Drayson Valley, Alberta. Weight estimates range from 197 pounds to 230 pounds, far larger than the Idaho Department of Fish and Game's figure for the average weight of an Idaho wolf—120 pounds. But wolves always look bigger when hanging in that position and alongside a hunter, Grimm said. "That guy is not a real big guy," he said, adding that much smaller wolves usually look larger in photos. "The biggest wolf that we've ever weighed was 135 pounds. When you hung it up, it looked that big." Grimm said the wolf in the photo is not larger than 135 pounds, and certainly does not approach record-breaking weights. In addition, he said, the wolf was definitely not killed by state Fish and Game. "If this wolf was killed in a control action, it would have been [Idaho Wildlife Services] that did it," he said, and the hunter in the photo is not a Wildlife Services employee. "These pictures of wildlife crop up all the time, whether it's a big bull elk or a rumor of some big kill," he said. "A lot of what you see, you have to be real careful about interpreting." Though Facebook and Twitter have increased the speed at which photos can circulate, Grimm said emailed photos have made their way onto websites in the past and gone viral that way. Jessica Walker, a customer service representative at Sportsman's Warehouse in Twin Falls, said hoax photos submitted for the store's "brag board" are generally easy to spot. "You can kind of tell," she said, adding that the store has not had a significant problem with falsified submissions. However, some photos that seem too good to be true actually are real, she said. "We had one that's up there that was a 6-foot rattlesnake," she said. "If it wasn't for one of our girls here whose cousin had found [the snake], you would have thought it was fake." One photo that has recently circulated across the state is a picture of a female hunter posing next to a wolf she shot with a handgun while bowhunting. That photo is real, Grimm said, and the story behind it was tracked down by the Spokesman-Review newspaper and the Clearwater Tribune in Orofino, Idaho. Rene Anderson, a 55-year-old woman from Headquarters, Idaho, was elk hunting on Sept. 25 when she was allegedly charged by a wolf. Thinking quickly, Anderson pulled her .44 magnum Smith and Wesson pistol and killed the 100-pound wolf with four shots. "That's real," Grimm said Monday. "Some of that stuff that's written in those emails is not necessarily confirmed, but she was bow hunting in Idaho and she did shoot that wolf with a handgun." Smith, Walker and Grimm said there wasn't a sure-fire way to tell a real "brag shot" from a fake, unless a photo has been obviously poorly manipulated using photo-editing software. Grimm called wildlife officials from several states to try and track down the false wolf photo, and said making calls and following the trail is really the only surefire way to tell a hoax. "Call somebody who really might know before forwarding it on," he said.